Most electronic assemblies are inherently designed to not be susceptible to electrostatic discharge (ESD) once in a completed unit. Until an item is fully assembled there are opportunities for electrical over stress (EOS) that can result in the early failure of your product. After receiving your electronic assemblies from an electronics manufacturer, how you store, handle and install can lead to product success or problems down the road. 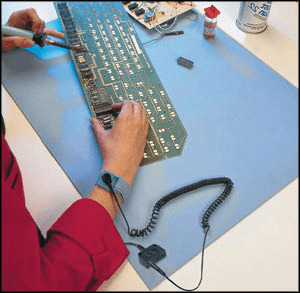 Over the years here at RBB, I have seen our efforts continually grow on how to prevent ESD during the manufacture of a product... from electrostatic dissipative floors and foot/wrist straps to include ESD mats, chairs, tools, bins and smocks. All of our packaging is geared to allow safe transport of circuit boards to prevent ESD. All these measures have been implemented to ensure electronic assemblies and products have not been subjected to any ESD that could harm your product. As part of Engineering Support at RBB, I have had the opportunity to visit customer sites on several occasions. I have found that how electronic products are handled varies greatly in each facility. Some facilities have electrostatic discharge mats, wrist straps and other measures while other facilities are installing products on plain wooden benches with no ESD protection evident at all. Whenever any of our personnel have observed this we have always brought it to the attention to those involved. I am writing this to help make aware of what steps are recommended for assembly and installation areas to help prevent ESD related problems. A good first step is keeping the product in its anti-static bag until it is required to be removed. Your product can be kept almost indefinitely in its anti-static bag without any loss of ESD protection and the packaging will also decrease the likelihood of physical damage. 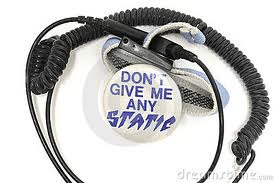 When ready to remove an item from packaging for test or installation, wear a wrist strap or other static control device that has been tested and are sure is working properly. Providing an anti-static bench mat that is kept clean using the recommended cleaning agent gives the workstation a less likely chance to promote ESD problems. Keeping the workstation clear of unnecessary items that can generate static is also quite helpful. Beyond this there are many additional preventative tools available that can make your assembly and installation areas world class. A quick internet search can bring an almost unlimited amount of information on electronic assemblies and how to apply them to your specific needs. As always feel free to ask an RBB customer liaison for advice and assistance on these issues. They are here to help you succeed. Jeff has worked for RBB Systems since 1998 and previously in the late 70's to early 80's. He is currently handling service and is part of the engineering support team. In his free time, Jeff enjoys movies (especially the drive in), problem solving and a good steak off the grill. How an electronic manufacturing company ensures proper handling of your future electronic assemblies is important. Check out our circuit board manufacturer checklist to help evaluate different circuit board manufacturers and to find out whether the partner is a good fit for your needs.